Palestinian youth demonstrate in Nablus, demanding peace and calling for non-violent opposition to the occupation. Palestinian youth from across the West Bank demonstrated near Al Najah University in Nablus on Monday. The demonstrators held a long banner bearing slogans calling for peace, supporting non-violent struggle, and thanking the countries that opposed U.S. President Donald Trump’s recognition of Jerusalem as the capital of Israel. The demonstration was organised by Zimam, a Palestinian grassroots movement. 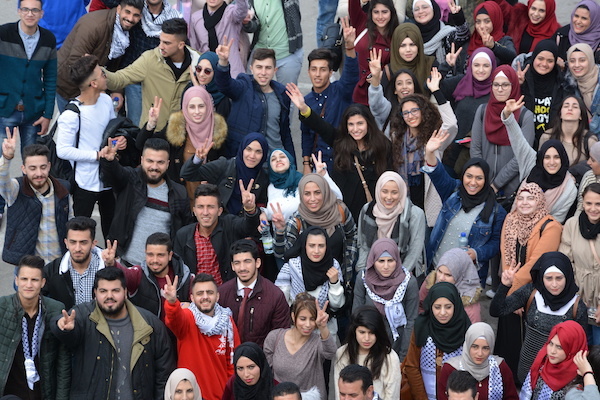 Samer Makhlouf, CEO of Zimam, said that the demonstration was intended not only to provide Palestinian youth “with a platform to express their anger and frustration in a constructive way,” but also to fight extremism and promote unity within Palestinian society. Founded in late 2015, Zimam has 22 chapters in the West Bank and Gaza Strip and a membership of 1,500, Makhlouf said.